If you have been looking for the best toys for older cats but you don’t know how to go about things, you’ve ended up in the perfect place. After doing a lot of research on the topic, we came to the conclusion that the Petstages Tower of Tracks is the product that you should first consider. It’s convenient, easy to use, and safe, and it’s made of durable materials that will enable it to withstand the test of time. Also, the three balls contained inside the layers can’t be taken out even by cats that are extremely persistent. It’s a great toy to use for when you’re out at work or at school. If this option is no longer available, perhaps you should consider our next favorite alternative, the Cat Dancer Products Rainbow Charmer. If your cat doesn’t really like to make a lot of effort to have a bit of fun, this toy from Petstages might make for a good choice. 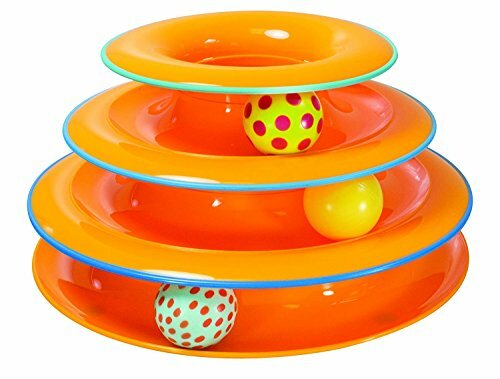 It’s made of durable materials, so it will last for a decent amount of time, and the balls can’t be taken out of the levels, so your cat will just have to try that time and again. The non-slip base allows this product to remain in the same place you put it. As with other toys, your cat will eventually get bored of this one. A great budget-friendly toy for younger and older cats alike. If you have a cat that’s maybe a little overweight and he or she doesn’t get a lot of exercise, this is the right toy to pick if you want to play with your pet at night. It’s made of durable and safe materials and it’s marketed as being unbreakable. Because it doesn’t contain any potentially dangerous parts and it wasn’t treated with any toxic substances, this one’s an excellent option. It calls for a bit of effort on the behalf of the pet parent. A highly affordable and convenient toy that will have your cat running around. The catnip balls in this set will have your cat having fun in as little time as possible. This product appeals even to cats that really do not like to engage in any type of physical exercise. The catnip in these balls is organically grown and completely safe, so that’s good to know. Made in the United States, these toys will keep your feline friend occupied for a good deal of time. These balls can be destroyed by cats that are really persistent. If you’re looking for a toy that includes catnip, this one should be on your list. Sometimes, it can be tricky for you to play with your cat, especially when you get back home from work and you’re tired. However, this toy is made specifically for felines that tend to spend a lot of time on their own. We would recommend choosing this product along with other types, too, because they will all provide your senior cat with a lot of entertainment and exercise. The neat thing about the Tower of Tracks is that it is durable, convenient, and effective. It boasts a stacked and sturdy construction, and it comes with a non-slip base, which means that it will remain in the exact same spot where you put it initially. The track toy is fully capable of offering your cat plenty of physical, as well as mental fun. Having garnered the appreciation of thousands of satisfied pet parents, we say that this product might be worth looking into, especially since it doesn’t cost a fortune. Your cat might no longer be that agile once he/she reaches old age but that doesn’t mean he/she is not in the mood for play. 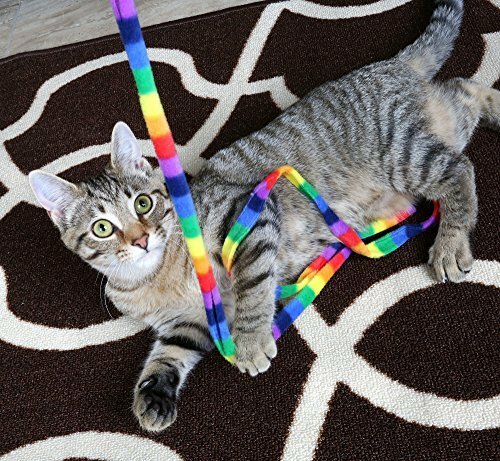 Cats love to play and that’s what Cat Dancer Products had in mind when creating this rainbow charmer. Targeting your pet’s attention and physical activity, this product makes a great toy for cats of all ages. Being physically active means keeping a good health level and older cats need that more than ever. This colorfully designed toy will grab your cat’s attention and tease your pet enough to make him or her want to chase and catch the moving rainbow. 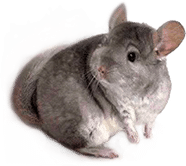 The use of it requires your involvement and that makes the toy even a better option as you will get to spend time with your pet and strengthen that beautiful bond. The material used is durable, unbreakable, safe, and nontoxic. The four feet of rainbow-patterned fleece is attached to a solid wand that won’t break too soon. Ball toys? You can never go wrong with them no matter the age of your cat. 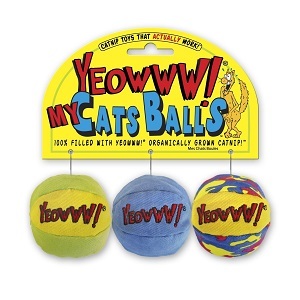 If your cat’s toy box needs a revival and you’re on the lookout for cheap toys for older cats, this set of 6 balls from Yeowww will get you that purr you like so much. The best toys to trigger your cat’s attention and get that mental and physical engagement you’re after are the ones that move, whether you make them move or they move by themselves. Balls are therefore ideal. The two packs include a total of 6 balls filled with organically grown catnip, just enough to cover your cat’s needs for an extended amount of time. You can use the balls as they come, that is, on the header card, or you can remove them so you can throw them around your place and make your cat exercise even more. Each ball is 2” in diameter and has a different pattern. Super Roller was created for super cats just like yours. Take your furry friend out of boredom’s claws with this fun roller circuit from Catit and you will get to add excitement to your cat’s playtime by engaging him/her in activities that will stimulate him/her both mentally and physically. Chasers are a hit among cats and this toy will help your cat unleash his/her hunting behavior by making him/her chase the ball inside it. 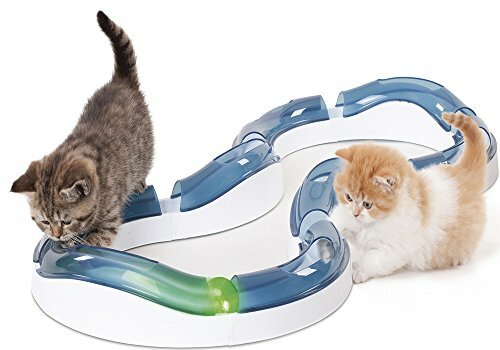 The product features 8 large pieces and high and low sections, enough for two or even more cats to play at the same time. The motion-activated illuminated ball zipping around the inside will make your cat chase and swipe at it and that’s what makes hunters like cats feel at their best. 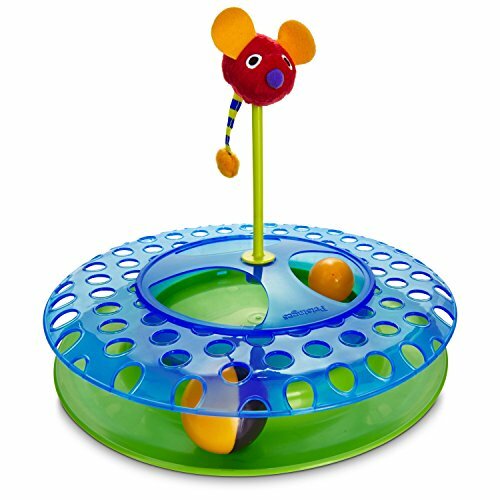 The large openings along the circuit make the toy more enticing as the cat gets to touch the ball and thus want it and chase it even more, quite a good way to spice up things for an older cat. Old cats, bored cats, young cats, they will all find fun in this cheese chase toy from Petstages. Designed to activate your cat’s natural chasing instincts, this toy is a reward for cats of all ages as well as for owners. The toy can be used in three different ways, so it can suit your cat’s preferences and mood. If it’s in chasing mode, the balls inside the circle will be just what your cat needs. In order to make playtime even spicier, the toy comes with a plush mouse your cat will surely find quite appealing. Plus, it is filled with catnip. Treat time, too, and you don’t need a new cat bowl anymore. 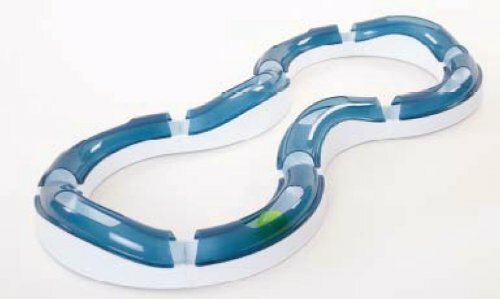 The holes in the upper part make the whole toy even more enticing as your cat will get to touch the ball and move it. Aside from all the fun it provides your cat with, the chaser is also colorfully designed and durable enough for rough players. It’s true that old cats don’t have the same vitality as young cats but that doesn’t mean they don’t want to play. Cats are creatures of play by their nature. Give them something to chase and you’ll be surprised to see all the energy that seemed gone taking over. This means that your cat-related items shopping list won’t be just about comfy cat beds, new slow-feed bowls for cats, or quality dental care products for cats once your furry ball gets older. Toys are needed, too. Still, older cats are no longer that agile and they won’t spend the day jumping and pouncing. The products that fall into the laid back toys category are recommended. Although cats love to jump and hop, such activities might prove to be more challenging for older felines. This doesn’t mean that your cat will be confined only to his/her cozy cat carrier, though. When looking for toys for older furballs, you might want to consider those that require your cat’s physical involvement at a decent level. Your cat needs to be active but too much activity might be just…too much for an older cat. Fake mice and feather wands you can use to tease your older cat might be ideal. Tunnels and hiding places such as cat trees also make a great addition to your cat’s toy box. Now, not all old cats are the same. Your aging feline might boast the same energy as in his/her early years. Your cat’s unique personality, preferences, and health level are the ones that decide the toys that get into your shopping cart. The market is generous enough when it comes to pet toys. You might reach the pet store and find yourself puzzled by all the variety of cat toys. Choosing the right one for your furball depends on your cat’s preferences and health status. Catnip toys are usually a hit no matter the age of a cat. They love to tease it until they reach the rewarding stuffing. Catcher and charmer wands are also popular among older felines as you control the movements of the toy based on your cat’s level of energy. An electronic motion toy, for instance, might be just too exhausting for a cat in need of slow play. If your budget doesn’t allow you to hit the order button too often and you’re interested in getting toys that last, even if that might prove impossible with rough players, one thing to keep in mind when looking for cat toys is their durability. Don’t underestimate your old cat’s vitality. It might surprise you. Go for sturdy products that can put up with your cat’s hunting behavior. Plus, try to go for non-toxic fabrics and materials and try to avoid toys that come with small parts your cat could swallow. Toys must be fun and safe at the same time. Therefore, even if you’re on the lookout for toys for soft play involving older cats, pay attention to the quality, safety, and durability you get. Chasers make good toys for older cats, kittens, and all the others in between. Cats are hunters by nature, so a toy that makes them chase a prey, whether it is a light like in this case or some feather item, will trigger their hunter behavior. This LED light chase toy from iGearPro will engage your cat both mentally and physically. 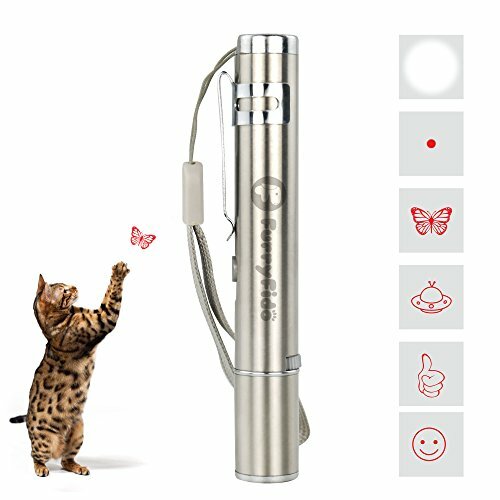 Using this product is safe for both the owner and the cat as long as the light is not pointed directly at someone’s eyes including your cat. You can take it with you wherever you and your cat go. It takes little space yet it provides a lot of fun. The toy features a stainless steel finish, which makes it durable and ideal for long-term use. The package includes a USB cable that can be used with any socket or computer. You can use the LED for 10,000 hours and in three different colors: red, purple, and white.